Nocatee residents love Northeast Florida's sunny days and mild nights, and love moving their indoor Nocatee Fitness Club work-outs outside on especially sunny days! 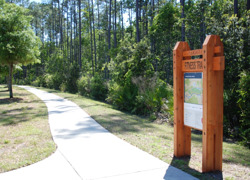 Residents wanting to enjoy the beautiful scenery or those simply tired of their current indoor fitness routines, have started utilizing one of the community's coolest recreational features - the Nocatee Fitness Trails. The Nocatee Fitness Trail path signage is now located behind Splash Water Park, Nocatee’s featured amenity. Walkers, runners and bikers can choose between three different color-coded running routes - two mile, five mile and six mile distance trails. The new signage conveniently indicates designated parking areas and nearby restrooms. 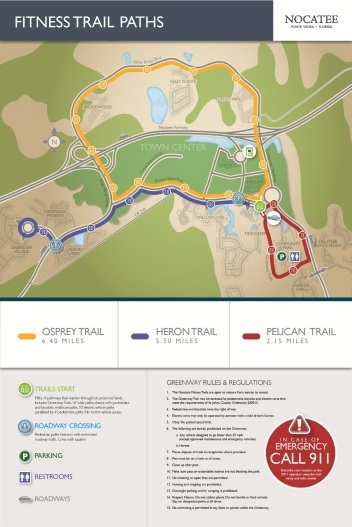 These running routes represent miles of existing preserve land pathways that include the Nocatee Greenway Trails and multi-use pathways, all electric-vehicle friendly. Not far from these trails is the 2,400 acre Nocatee Preserve that stretches 3.5 miles of the Intracoastal Waterway. Those looking for a more "off-road" trail running or riding experience have an 8 mile trail to explore in and around these preserved lands. To learn more about Nocatee’s numerous onsite recreational opportunities, visit the Nocatee Welcome Center or call 1-800-NOCATEE.